The WISPR instrument is made of two telescopes that are designed to sit between the two antennae from the fields experiment and image the solar wind and corona as were flying into it. So WISPR is the latest instrument. Scientists have built it for really two requirements, they wanted to able to see far from the spacecraft and then be able to track the structures that are flowing out from the sun and then as they passed the spacecraft we would see them locally at the spacecraft. The WISPR instrument is the only imaging instrument on the Parker Solar Probe and it is looking in the direction that these spacecraft are traveling and what it sees is light scattered by the dust that is in orbit about the sun. But then once we remove that what we see is the light scattered by the electrons in the corona, In the solar wind. These measurements that were made from the WISPR instrument have been made before by other instruments from 1 AU from distance of the earth about one million miles from the sun. By getting closer we are increasing then the ability to see what is really close to the sun. The fact that you are close means you, you don't have all this. This material that is in between you and the object that you really interested in and that contributes to background noise. And so you are looking at something that's much more pristine you are looking at just that object all by itself. By going eventually 95% of the way to the sun. We are going to able see what is a dust free region around the sun that is going to be the exciting part. 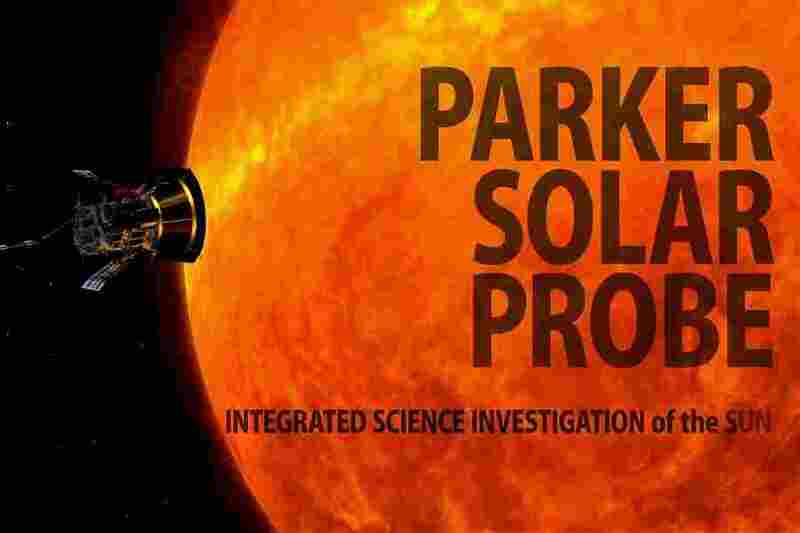 Parker Solar Probe cannot have any imager that looks at the sun directly. So WISPR instrument looks off of the heat shield that protects us from this very intense. And so we sort of peak over the edge of it we use it as a shield to block out sun itself and that allows us to see this very faint glow coming from the corona that is only observed during the clips. For example, we are creating an artificial Eclipse. What clip Cesare great but from the data point of view it looks instruments better. They are working continuously around the clock. Seven days - A Week, 24 hours - A Day, 365 Days - A Year. In a special place on the spacecraft that electronics package is inside the spacecraft. Where most of the Optronics are, but all of our sensors are mounted on the outside of the spacecraft. We have three sensors that measure magnetic fields that are mounted on a boom behind the spacecraft in the shadow shield and then we have five sensors that measure the plasma voltage. These are the electric field sensors. They extend into full sunlight and they get very hot. When Did The Discovery Of Pluto? Who And How Discovered Pluto? Two of the key measurements to understanding coronal heating are the measurement of the magnetic field and electric field. Together they give us what is called the Pointing Flux, that is the energy flux of the Corona. That measurement we have to actually go into that plasma and put sensors in the plasma to measure magnetic field and electric field directly that is what fuels will do. The solar wind is the escaping atmosphere of the sun that is the escaping half of the sun. The Corona is heated in a way that we don't understand yet, presumably involving magnetic fields by the energy that comes from below and Photosphere and it is heated to such a high temperature that it can escape the gravitational potential of the sun and become an escaping wind, stellar wind, a solar wind. Well, the design of the fields instrument is a new thing for solar wind physics. It kind of combines two previous styles of experimentation. There are two ways to measure electric fields in space. One is using a technique that is called a Double Problem then there is another technique which is measuring plasma waves or radio waves and fields. For the first time brings these two techniques together. I think the very first data we get will be revolutionary. At first blush, it will be a bunch of numbers as a function of time but the science team will take those numbers and make visualizations in the forms of spectrograms and eventually those data will be related to models and so we will be able to compare directly 3D visual models of the Coronal magnetic field. These measurements have never been made in the environment close to the sun. We have made measurements similar to this in the earth's magnetosphere, iris ionosphere. But putting a package like this into the solar corona. It is just never done the closest anyone's ever been to the sun and based on what we have seen so far from spacecraft, not quite as close it is going to be striking. The ISOIS investigation of the sun is an experiment which looks at energetic particles over a broad range of energies ( From tens of thousands of electron volts up to about a hundred million volts ). The ISOIS instrument is based on solid - state detectors. Those are detectors that when a particle passes through them, energy is deposited and you can measure that energy as well as you can measure that the particle is actually passed through. So there is the solar wind which is this continuous flow of lower energy particles and then there are much more sporadic and episodic events like solar flares that spew out the great number of these mean much more energetic particles. In our higher energy instrument, we have the whole set of layers of these detectors. When the particles pass through these layers it leaves energy in each and every one of those detectors. Those detectors are also segmented in pieces like a pie. So when a particle comes from a particular direction, you can tell both the direction, the particle came through and the energy and species of the particle by looking at all the different energy depositions. Complete Information About Journey Of New Horizons Probe. Information About The Instruments Used In New Horizons Probe. In our lower energy instrument, we also have the same sort of solid state detectors. But in addition to that, we use an extra trick. Which is when a particle passes through a very thin foil it ejects an electron we are able to detect that and that gives us the start timing for the particle. One of the big issues of ISOIS is to understand the difference between solar energetic particles that just comes from the sun with a certain energy and those that are energized in interplanetary space as they move outward. With the time, they get out to the earth's orbit, that is all so messed up and mangled up and it is hard to tell the difference between those.